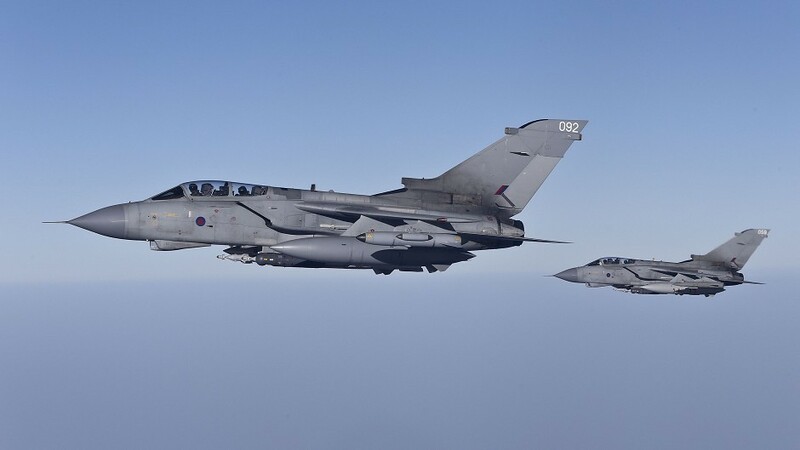 Two RAF Tornado jets almost collided over Losiemouth in Moray while coming in to land, an official report has revealed. One of the pilots assessed the risk as “high” and investigators said only “drastic” action avoided a collision. The UK Airprox Board – which probes near misses blamed a “misjudgement” by an inexperienced Lossiemouth Tower controller. The near miss happened on November 26 as both aircraft – known as Axis 1 and Axis 2 – were below 700 feet above the Lossiemouth base. The HQ Air Command said the incident highlighted the requirement for crews to maintain a high level of situational awareness and a robust lookout when joining or operating within a busy operational aerodrome and, if required, question the direction given by air traffic control. “Despite the best intentions of the Aerodrome Controller to provide flexible management of the visual circuit, limited experience of controlling this aircraft type and at this location led to the visual traffic being sequenced ahead of the instrument traffic and into confliction on finals,” it said. “The crew of the Axis 2 had discussed the likelihood of being required to position behind the arriving instrument traffic. The allocation of priority in the visual circuit was unexpected and caused the crew to alter their plan. “Despite not fully understanding the intentions of the arriving traffic, an opportunity remained to continue with their original plan, thereby removing the potential for conflict. The crew of Axis 1 arriving via an instrument approach were visual with the circuit traffic and had situational awareness regarding the potential conflict for some time prior to the incident. Whilst remaining visual with the conflicting traffic, the crew of Axis 1 elected to continue their approach to the point where they felt concerned about the proximity of the other aircraft. The UK Airprox Board said the crew of Axis 2 were “seduced” into following the controller. “Once the aerodrome controller had given them landing priority downwind they were then seduced into following along with his plan, perhaps against their better judgement,” it said. “This led the board onto lengthy discussions regarding the air traffic control role in the Airprox, and the dangers of trying to second-guess what other aircraft might be doing, or be capable of doing, when faced with a confliction. “Acknowledging that the precision approach radar (PAR) controller was relatively inexperienced, the Board was disappointed that he had not given traffic information to Axis 1 on first spotting the potential conflict on his radar. However, they were heartened to hear that new simulator scenarios to include the need to give traffic information were being included in PAR training packages, and that these were to be used RAF-wide. “Turning to the actions of the aerodrome controller, the Board heard that he was relatively new to Lossiemouth, had spent most of his training there using RW05 (another runway), and so had limited experience integrating radar and visual circuit traffic on this runway. “His previous unit had apparently not had the same visual circuit operating limitations or complexities as Lossiemouth, and he was therefore not attuned to anticipating a wider visual circuit on RW23 to avoid the local town – which then put the two aircraft in proximity with each other due to the extended track of the aircraft in the visual circuit. “Again, members were pleased to hear that Lossiemouth were planning to address this training shortfall in the future. The Board also noted that, in this case, whilst well-intentioned, the controller’s plan to get both aircraft in from their approaches was based upon the flawed use of the “if visual call tower” procedure for the PAR aircraft. This procedure was not intended for use in this scenario, but instead for ones where use of the runway by radar traffic was assured. “Furthermore, its use in this scenario relied upon the radar traffic becoming visual with the circuit traffic at a relatively late stage in the approach which, with traffic turning finals in the visual circuit, had the potential to be dangerous. Moreover, without a positive clearance being passed to the radar traffic, visual circuit information would also not have been passed. Fortunately, in this situation the radar traffic, Axis 1, was visual with the circuit traffic and elected to break off the approach at the same time as the visual circuit traffic ‘bunted’ below. “The Board agreed that it had been a misjudgement of sequencing by the Lossiemouth Tower Controller that was at the root of the incident. However, they then discussed, at great length, whether the aircrew, and in particular Axis 2, had contributed to the event by allowing the situation to develop to a point where the aircraft were so close that drastic action had been required.